Be the first to share your favorite memory, photo or story of Lois . This memorial page is dedicated for family, friends and future generations to celebrate the life of their loved one. 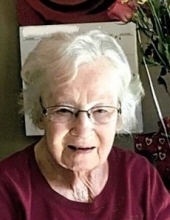 Lois A. Kaderavek age 93 of Hillsboro passed away on Thursday, November 15, 2018 at the Dycora Transitional Health and Living Center in Muscoda. She was born on May 12, 1925 in Henrietta Township, Richland County the daughter of Samuel and Clara (Robinson) Long. She was married on March 31, 1943 to Paul A. Kaderavek. Lois was a wonderful cook and made great pies and snacks always welcoming people back as they were leaving. She took great pride in the farm where she worked many long hard hours. She enjoyed her flower gardens, watching birds and playing euchre and buck euchre and loved her large collection of Beanie Babies. Lois really enjoyed living her last 4 years at the Dycora Transitional Health and Living Center in Muscoda. Survivors include her son, Larry (Kristine) Kaderavek of Tomahawk, WI, her daughter, Diane Kaderavek and Robert Anglin of Madison, 5 grandchildren, COL “retired” Robert (Catherine) Kaderavek of Pewaukee, and their children, Sarah, Grace and Emma Lois, Matthew (Laura) Kaderavek of Tomahawk, Larissa Kaderavek and Ben Potter of Sun Prairie and her children, Kane and Kael Dahler, Leah (Billy) Robertson and their son, Oliver, Paul Idyk of Madison, 2 brothers, Leland (Kathy) Long of Hudson, WI, Ed Long of Dayton, Ohio, a brother-in-law, John (Jeanette) Kaderavek of Cazenovia, a sister-in-law, Ann Kaderavek of Hillsboro, many nieces, nephews, other relatives and friends. She was preceded in death by her parents, Samuel and Clara Long, her husband, Paul Kaderavek and 5 siblings. Funeral services will be held on Monday, November 19, 2018 at 11:30 A.M. at the Stafford Funeral Home in Richland Center. Visitation will be held on Monday at the Stafford Funeral Home from 10:00 A.M. until the time of service. Graveside services will be held on Tuesday, November 20, 2018 at 10:00 A.M. at St. Patrick’s Catholic Cemetery in Melancthon Creek. Online condolences available at www.staffordfuneralhomes.com. "Email Address" would like to share the life celebration of Lois A. Kaderavek. Click on the "link" to go to share a favorite memory or leave a condolence message for the family.